Doctor Who continued its run of new episodes with ‘The Unquiet Dead,’ marking the first story not written by Russell T Davies and shrewdly choosing to follow up its invasion in the present in ‘Rose’ and its futuristic adventure in ‘The End of the World’ with a horror story set in the past, firmly cementing the breadth of the programme’s potential and bringing new viewers completely into the fold. The Doctor himself seems to be quite overjoyed at the prospect of being in the past and coming across Charles Dickens, exclaiming his love of ‘The Signal Man’ in particular. Eccleston gets to portray elements of a lighter Doctor here, especially at the beginning, one getting a much-needed reprieve after experiencing such atrocities before meeting Rose. Along the way, ‘The Unquiet Dead’ suggests that there could be just the faintest hint of some romantic feelings forming within Rose. While hints of romance within the TARDIS are certainly not new to the programme, this could be an intriguing avenue to explore given the change in times and what is now allowed on television compared to the classic series’s broadcast dates. For Rose, in particular, this is a logical continuation of the more well-rounded character development begun with Ace in the late eighties. ‘The Unquiet Dead’ achieves a great deal of characterization for the Doctor himself as well, elevating itself from the potential pitfall of simply focusing on the novelty of having Charles Dickens experience the alien Gelth invasion. It first shows that the Doctor does not share the same sense of morals that humans do, considering the Gelth’s plea to take over dead human bodies as a logical solution to their plight. It also proves that, though the Doctor is perfectly willing to sacrifice himself, he doesn’t necessarily take the time to think about what his actions could mean for his companions and how dangerous the situations he puts them in can be. These facts allow for a rather unique dynamic to form between the leads as, for the first time since Romana or possibly Ace, the Doctor and companion challenge one another’s beliefs and thoughts. Rose proves to be his anchor in a world among humans, able to communicate and relate with individuals on a much more personal level than he can, a nice complement to the way in which the Doctor opens people’s eyes to the much wider world around them. Hearkening back to the guilt and anguish that the Doctor is clearly still feeling about the Time War, the Doctor is put into a rare situation of weakness, the Gelth taking advantage of his suffering to pretend that they are in need to his help to escape extinction. It’s rather interesting for the Doctor to potentially put Earth into a dangerous situation to save an entire civilization, a viewpoint previous Doctor would not have shared. Although the ending is rather convenient, the Gelth look spectacular in their limited screen time and provide a unique threat for the Doctor to face. 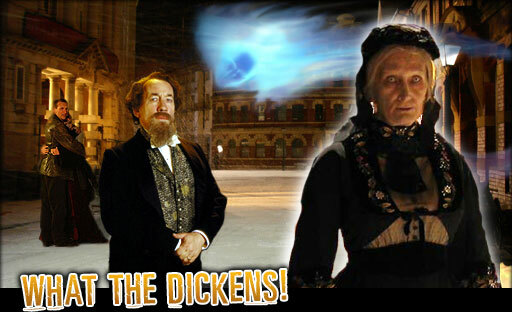 The inclusion of Simon Callow’s Charles Dickens only serves to enhance the experience, and in a way the second lease on life he attains through this adventure is a nice mirror for the Doctor. With excellent setting and stage design that bring the Victorian Age back to life and some very strong performances and characterization, ‘The Unquiet Dead’ becomes much more than a typical invasion story and further cements the strong trajectory the new series of Doctor Who is already following.